Birds and Bagel – Let's Paint Nature! 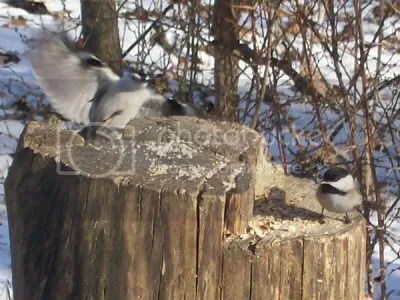 Just a few bird pictures from my hike last weekend, here we have a tiny little chickadee and an incoming downy woodpecker. Now that’s odd. 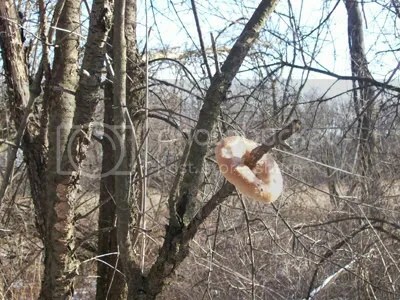 It’s not everyday you find a bagel in a tree. Someone left this bird treat on a branch for easy bird access. By the looks of it, some winged friend already had a taste. 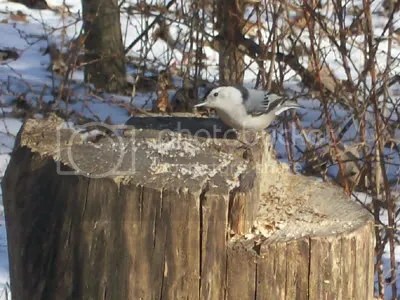 This nuthatch has his eye on me. Don’t worry little guy, I won’t bother you. These birds calm me down and replenish my worrisome mind. ← Let’s Paint Winter Woods! Watching birds isn’t as “boring” as many people think. I find it both soothes me AND recharges my batteries. Gotta love the little, winged critters!